In this segment of The Mind of a Leader, learn how dangerous it can be to take counsel from flatterers and how to find those that offer honest counsel. 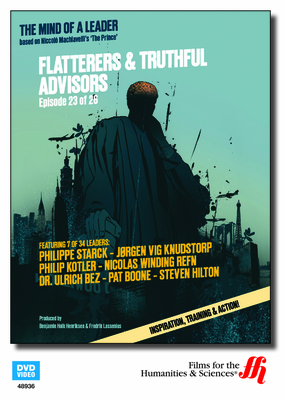 Continuing in the series, The Mind of a Leader, this program covers the dangers of flatterers and leaders using truthful advisors. In Niccolo Machiavelli’s novel, The Prince, Machiavelli discusses that leaders can easily fall prey to people who flatter and they should only rely on those they trust fully. In this half hour program, a panel of experts, including Philippe Starck, discuss Machiavelli’s advice and their opinions on separating people who only want to flatter versus the people who will offer honest counsel. Pat Boone discusses ways to maintain integrity, using himself as an example. A few of the other panel members are Philip Kotler, Steven Hilton, Dr. Ulrich Bez, Jorgen Vig Knudstorp, and Nicolas Winding Refn. By the end of this program, viewers will have a better idea on how to separate yourself from others so you can use clear judgement on those you take counsel from.